It is so hot i can’t even begin to tell you one step outside and one feels one is being scorched. Its really bad and the only thing that one actually wants to eat is lots of juicy chilled fruits and salads and of course ice creams and sorbets or granitas, I for one can’t think of having anything else. 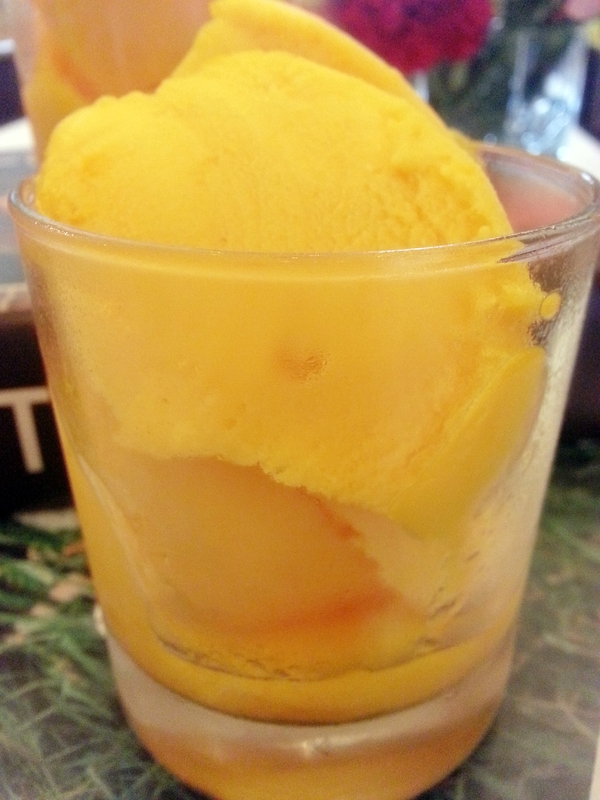 Since morning I have been eating this delicious yet extremely easy to make mango sorbet.Its hardly any work and your ice-cream maker pretty much does all the job but if you don’t have one its a tad bit irritating but its worth it, the end result is this beautifully goldenie (is that even a word) mango coloured frozen goodness that tastes as if I just forgot my mango in the deep freezer and have just taken it out and am biting into it- full of flavour!!. 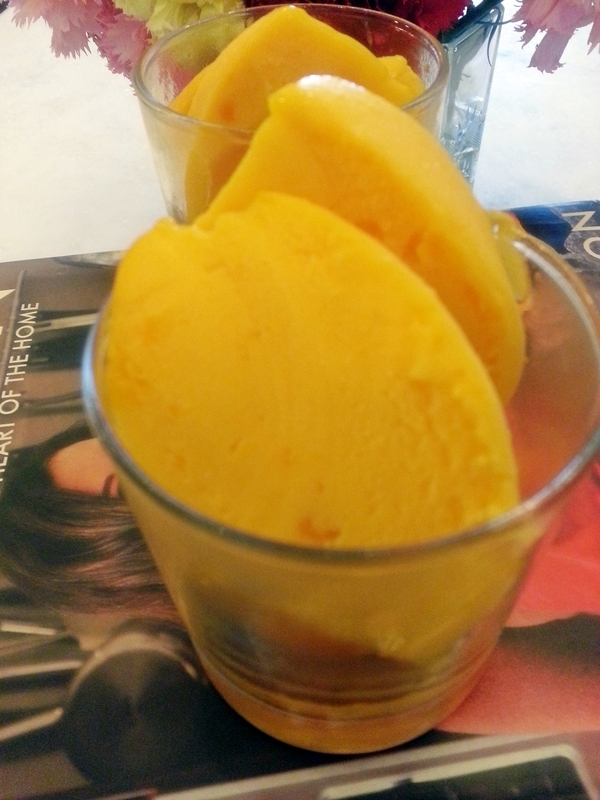 Just use the best mango puree or really golden ripe mango that you can lay your hands on. To make the basic syrup, place the sugar and water in a large saucepan over low heat and stir without boiling until the sugar is dissolved. Increase the heat and bring it to boil for one minute, take it off heat and set aside to cool. Meanwhile combine your mango puree and 1/2 cup lime juice and add it to the now cooled basic sorbet syrup.Place in your ice-cream maker and follow the manufacturers instructions. If you don’t have an ice cream maker, place the fruit and syrup mixture in a metal bowl or cake tin, cover and freeze for one hour or until just beginning to set at the edge. Beat with an electric hand mixer or whisk and return to the freezer. Repeat three times at hourly intervals or until the sorbet is thick and smooth. Oh my god!! It just looks yum! Thanks. It is so fresh and so full of mangoness unbelievable! 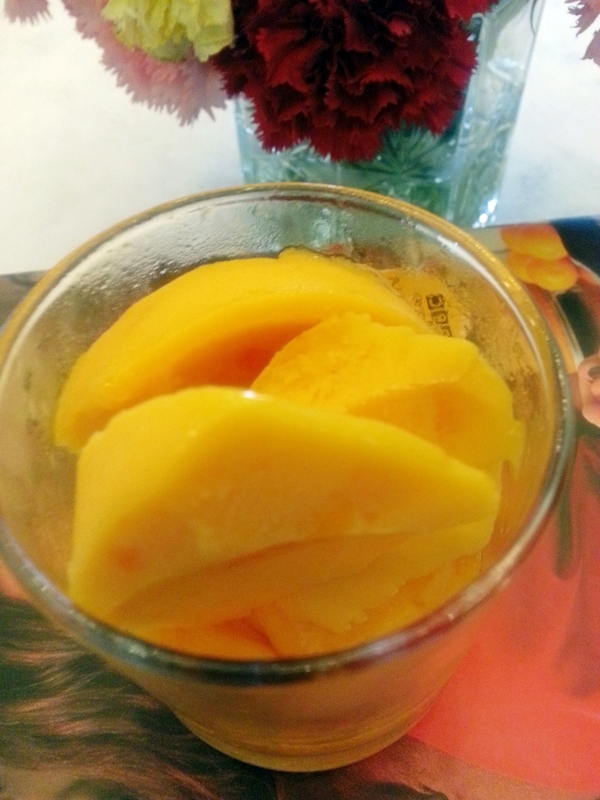 Mangoes are alway such a pleasure to eat. Your recipe sounds delicious! Have a lovely weekend!